ROCHESTER, MN -- When the Supreme Patriarch of Buddhism in Cambodia decides to open a new school or build a new temple in his country, his thoughts turn to friends and financial supporters in Minnesota. The Cambodian Buddhists of Minnesota are hardly wealthy or powerful by American standards. At the two largest Cambodian Buddhist temples in the state, in Hampton and Rochester, the temples' lay members raise families on the basis of jobs ranging from the menial to the middle class. But from the vantage point of Phnom Penh, where the Venerable Tep Vong leads Cambodia’s 12.5 million Buddhists, the roughly 5,000 Cambodian-Minnesotans are seen much differently -- as a critical financial, cultural, and political support base. That’s why, when the Cambodian Buddhist temple in Rochester opened a new meeting hall last July, Tep Vong flew from Phnom Penh to Rochester to officiate over a three-day ceremony that drew the city’s Mayor, state senators and representatives, and about 800 Cambodian-born U.S. citizens. The Supreme Patriarch came to do some bridge-building, fund-raising, and pressing the flesh. “Rebuild,” because during the Cambodian holocaust of 1975-1978 the ultra-Maoist leader Pol Pot outlawed Buddhism and ordered the destruction of the country's 3,600 Buddhist temples, including irreplaceable ancient texts. About 1.7 million Cambodians died during the genocide, among them 50,000 Buddhist monks who were killed or forced to flee. Tep Vong, a young monk at the time, was ordered at gunpoint to take off his monk’s robes and then sent to a “re-education” camp where he spent three years digging ditches. After the Vietnamese invaded Phnom Penh in 1979, Pol Pot was ousted and Buddhism in Cambodia began to rebuild in an occupied country divided by civil war. After the Vietnamese left in 1989, chaos continued as Pol Pot’s Khmer Rouge party continued to exert influence and many coalition governments were formed and dissolved. With 95 percent of Cambodia’s 13.6 million population being Buddhist, the government’s leaders, especially the strongman Prime Minister Hun Sen, have had great incentive to restore close ties with Buddhist leaders who returned to Cambodia after the genocide to rebuild the religion. Tep Vong, as a Buddhist leader sympathetic to Hun Sen, has been instrumental in that process. 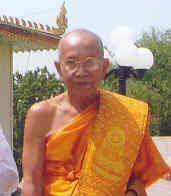 Named Supreme Patriarch of Cambodian Buddhism by Hun Sen in 1991, he has angered many of his own clergy by insisting that monks must not vote in elections – nor encourage lay people to vote. In interviews that echo the Rev. Pat Robertson’s statements that God’s vengeful hand lay behind 9/11 and Hurricane Katrina, Tep Vong has also intimated that Cambodia’s holocaust victims may have died at least in part as a result of bad karma built up in previous lives. "If it was not Pol Pot's evil deeds, it was our sin of bad deeds that we had done in our previous lives," he told the Documentation Center of Cambodia in 2001. "I'll never forget the sufferings I had in the [Pol Pot] regime. I was detained for 80 days and tortured ruthlessly. Nonetheless, I could bear all that agony since it was the result of my past life's bad deeds." In his embrace of Hun Sen, Tep Vong stands in contrast to Maha Ghosananda, his predecessor as Cambodia’s Supreme Patriarch of Buddhism, who has won several Nobel Peace Prize nominations for leading peace walks through Cambodia and calling for nonviolent solutions to war, land mines and deforestation. He lives in exile today in the U.S. Despite their differences, both leaders are playing a key role in spreading southeast Asia’s traditional brand of “Theravadan” Buddhism around the world – including in Minnesota. Since the 1960s, three major waves of Buddhism have washed over the U.S., beginning with the Japanese Zen tradition in the 1960s. More recently, Tibetan Buddhism has become popular thanks to the charismatic Dalai Lama, who is forced to live abroad because China occupies his country. In recent years, Theravadan Buddhism from Southeast Asian countries such as Burma, Thailand, Sri Lanka, and Cambodia – the last hastened by the Pol Pot genocide -- has formed a third wave of Buddhism visiting the West. The Rochester Cambodian Buddhist temple started in 1986 when a group of holocaust refugees, who had arrived several years earlier, scraped together the funds to bring a Cambodian monk to Rochester. The Rochester temple started in rented rooms, then moved to a two-story home whose living room was rehabbed into a shrine containing memorial photos of Cambodian Buddhist leaders killed during the holocaust, statues of Buddha, flower garlands, fruit offerings, and burning incense sticks. By 2003, the 300-plus Cambodian immigrant families who form the core of the temple built an actual temple or “wat” in Rochester that supports five monks and sports sky-tassel filials at each roof corner, a sun-eating Cambodian folk deity guarding the front door, and murals depicting the life of the Buddha. “He was shocked when he saw our temple,” said Sokhom Roth, the head monk of the Rochester Cambodian Buddhist temple, said of Tep Vong’s three-day visit last summer. “It was not only how big the temple was, but how many Cambodian monks were living here.” More than 40 Cambodian monks from a dozen states in the U.S., including Massachusetts, Nebraska, and Rhode Island, attended the ceremonies. Most members of the Rochester temple, Roth said, regularly send money to Cambodia to support the building of new Buddhist temples in their home provinces. More than $50,000 – an almost unheard-of sum in most Cambodian towns -- was recently raised to build a temple in Battambang Province. Sitting cross-legged on a cushion at the temple in July, Tep Vong said that the spiritual void created in Cambodia by the genocide posed his biggest challenge as Buddhism’s Supreme Patriarch in the country. Christian missionaries are aggressively making inroads, he said, as are Islamic fundamentalists who are building new mosques. In addition, Cambodia’s folk religion that stresses ritual worship of animist deities is also making a comeback. “There might be a religious war as a result,” Tep Vong said.